A frail, only child, Eric Slater was born in 1896 and spent his early years with his parents, grandmother and two servants in a large house in Hampstead, London. His father, Thomas, a successful silversmith and partner in the firm Aldwinkle and Slater, died when Eric was eight. Eric moved with his mother and grandmother to Sussex where he studied at The Hastings School of Art. He was probably taught how to make woodcuts by a neighbour called Arthur Rigden Read (1879-1955) who had been to Japan to study oriental woodcut techniques used by European printmakers from the 1890s. November 2018 saw the BBC's Countryfile visit East Sussex for a special report on the life and work of Eric Slater. Presenter Ellie Harrison was "on the trail of one of the 20th century's lost British artists". She spoke to expert James Trollope, author of the only book about Slater, and found out about Slater's fascinating technique. 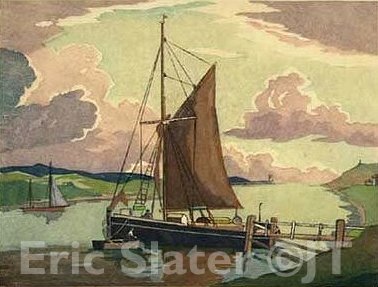 The BBC Antiques Roadshow team was delighted to discover some of Eric Slater's work when the programme visited Eastbourne. Fine art expert Dendy Easton said 'This to me is so evocative of 1920s and 1930s printmaking, and today this is very much in vogue' and described the prints as 'really lovely', a feeling echoed by the show's presenter Fiona Bruce. 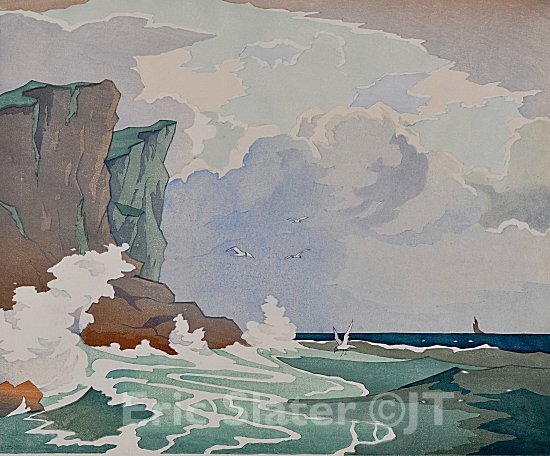 Slater's Sussex book launched at Eastbourne gallery - a report by BBC South East. 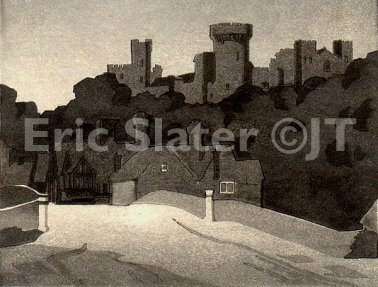 A new book about the artist Eric Slater, who made woodcut prints of Sussex landscapes, has been produced in a collaboration between a writer and a local gallery. Robin Gibson spoke to James Trollope, author of Slater's Sussex - The Colour Woodcuts of Eric Slater, and Julie Brown of the Towner Gallery in Eastbourne, where the book was launched. ITV Meridian visited the display of Eric Slater's work in the exhibition 'A Point Of Departure', which ran at the Towner Gallery in Eastbourne from May to November 2012. Reporter Malcolm Shaw spoke to James Trollope and Julie Brown, assistant curator at the Towner Gallery. European woodcuts, less formal than Japanese woodcuts, were marketed as affordable art for ordinary homes. 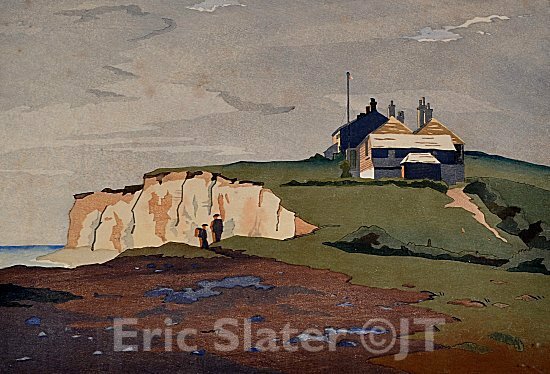 They were also popular in the United States where Eric Slater won a gold medal for his 1930 picture of Seaford Head. 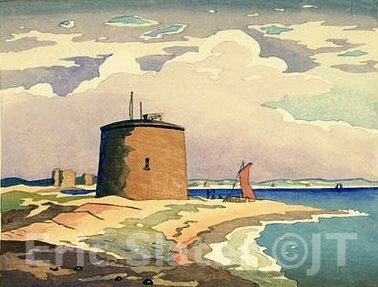 From his studio at his house in Seaford, Slater established an international reputation exhibiting in Canada, Australia, New Zealand, Austria and South Africa, but the death of his mother in 1938, the outbreak of war and changing fashions ended his career. Eric Slater died in obscurity in 1963. A solicitor’s notice in the Sussex Gazette made no mention of his art. He is buried in a shared grave at Seaford. 2013 was the 50th anniversary of Slater's death.